The Manufacturer’s Representative (Man Rep) solution gives Infor™ ERP FACTS users the ability to track bids, quotes, jobs, contacts, processes, and commissions directly in their Infor system. Combined with the Document Archive Management module, it can eliminate complex, manual job files and replace them with organized electronic job files. These electronic job files contain correspondences and documents pertaining to a particular job and integrate directly into your Infor system for quick, accurate processing and reporting. With Man Rep’s easy-to-use, built in tools you can create custom reports, track bids, manage jobs, calculate commissions and streamline the entire sales cycle. Bidding and quoting a job has never been easier with an intuitive quoting system that delivers a consistent and professional document every time. Bids management tools can list bids by multiple criteria and produce bid performance analysis for important sales meetings. Your sales reps will have everything that they need to create multiple quotes for multiple customers for the same opportunity and the proposals are portable to other branch offices. If you have parts from your warehouse, they can be incorporated into the quotes with real time availability along with up sell suggestions and companion item capabilities. With the ability to track quotes, bids and stages of the sales cycle, sales reps and sales managers have full view of the open or pending opportunities. Man Rep offers a wide array of useful sales tools such as tracking win/loss statistics and creating pipeline reports instantly. With the power of complete visibility into a job, the Job Management program is able to import information from the bid and the quote to the job, create transmittals, initiate multiple PO’s for multiple vendors, and view the costs both estimated and actual. With the ability to create numerous commission splits by the line level and import all related documents scanned, electronic or emailed, you make an all-in-one information nucleus for straightforward tracking of job profitability. Job organization is enhanced with the ability to schedule critical equipment requirement dates that trigger reminders and the reporting of vital job statistics. Ensuring that commissions are calculated correctly and paid promptly can boost a salesperson’s motivation and compensation, thereby driving more sales for the company. Moreover, timely commission payments can help your company’s cash flow. Man Rep provides a robust and flexible commission formula that can be tailored to your company’s specific needs and policies. The commission reconciliation creates transactions based on company parameters and automatically generates commission statements based on predetermined rules and formulas. Complete security is provided at the field level to ensure confidentiality and to allow additions and exceptions when needed. Win more bids with a more efficient and informed quoting process with Project Job Management’s easy-to-use and intuitive project manager for multiple bids, bidding calendar, online document manager, and tight integration with Infor Distribution SX.e. Managing numerous bids within a project—which may include several deadlines, different locations, many documents, and even multiple bidders—is a very complex process, especially when you factor in the inevitable revisions that take place before you even win a bid. To keep track of all these changing variables, you need a solution that’s designed specifically for distributors who manage multiple bids for professional trades and gives you the information you need when you need it to ensure that you meet every bidding deadline. With Project Job Management, you get a set of easy-to-use and intuitive bidding tools, such as a project manager for multiple bids, a bidding calendar that integrates with Microsoft Outlook®, and an online document manager. And because Project Job Manager tightly integrates with Infor® Distribution SX.e, your data can be automatically shared with and seamlessly used by your ERP system. As a result, you’ll be able to increase the efficiency of your quoting process and gain real-time access to your bidding information, so you can win more jobs. With Project Job Management, you can keep track of multiple quotes and bidders for a project, and even manage all of your projects and quotes (including revisions and change orders) on a single screen. You can manage multiple quotes and multiple customers by project, as well as things like bid times, bid dates, project types, project statuses, and even budgets. Access to so much data all at once can seem overwhelming, so this information can be more quickly comprehended by viewing it as graphical KPIs. You can integrate a project’s bid list with Microsoft Outlook’s calendar, so that you can easily see key information, such as who the bidders are and when each bid is due. To narrow the focus of what’s displayed, you can filter on things like only your projects, projects only at your branch, or just projects that are bidding in the next seven days. This integration with Outlook also allows you to create events and set follow-up reminders to help ensure that each person who is responsible for a portion of the bid is getting their part done at the right time. With multiple people working on different parts on a project, the amount of associated documents can pile up fast. All the information for a project, including things like emails, vendor quotes, spec sheets, CAD drawings, and scanned-in documents can be stored in a centralized, online document manager that’s easilyaccessible by anyone you designate across your company, regardless of which branch or office they’re in. When you’re bidding a job, it may be similar to one you’ve previously bid. Or, perhaps, the second phase of a multi-phase job may look almost like the first phase. With Project Job Management, you can easily import existing quotes over into new quotes, instead of having to create each new quote from scratch. You can also easily pull in groups of pre-determined items if you regularly build particular types of quotes. Once you’ve added the existing information, you can then make the necessary adjustments for the new quotes, such as updating the bidders, costing, and quantities. Project Job Management also gives you flexible, word processor-type functionality, so you can easily copy/cut and paste images and text and adjust formatting (such as bold and underline, and font type, size, and color). You can send out bids so that they’re automatically delivered via the means that each recipient prefers—whether it’s printed or emailed. Recipients’ and senders’ names and other information can be automatically personalized, so that you don’t have to rewrite a quote for each person on a bid list. Move lines up and down within a quote. Source lines to direct and non-direct purchase orders and warehouse transfers in Infor Distribution Sx.e. Override cost and price on line items to accommodate negotiations with vendors and customers. Choose whether to print line items and/or prices on quotes. 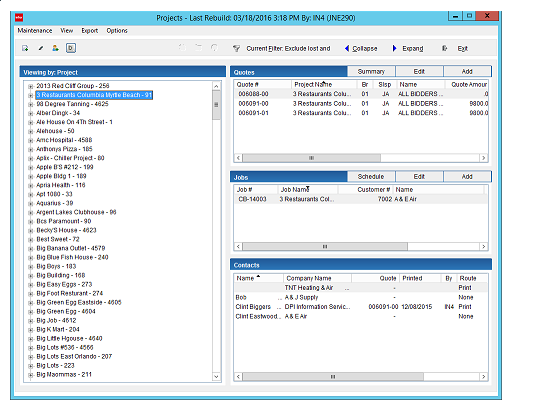 Release quotes to Infor Distribution SX.e by line item. As a distributor serving the needs of professional trades, you need a solution that can help you overcome the complexity that’s inherent in bidding contractor jobs. With Project Job Management, you get a solution that allows you to easily keep track of every aspect of the bidding process—including changes—no matter how many jobs you’re bidding. You’ll have the information and tools you need to make sure that the right bids with the right information go out to the right people at the right time.